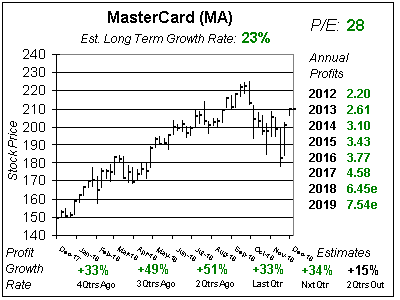 MasterCard (MA) is expected to produce mid-teens profit growth long-term, but 2016 is expected to have slower growth due to F/X as well as rebates and incentives MA gives to get new business, which usually occur in the early qtrs of a new deal. Business is good, with gross dollar volumes and processed transactions both rising 12% last qtr. But profit estimates for the next 4 qtrs are : -6%, 5%, 7% and 4%. With MA selling at 27x earnings, it’s at the top end of its ten-year range. Slow profit growth with a high P/E isn’t often a good formula for success. Also, profit estimates have been declining for 4 straight qtrs, with 2016’s number decreasing from $4.12 to $3.53 during that time. On the plus side the company has a stable business, above average safety and pays a 1% dividend in addition to stock buybacks. I really like MA a lot, but the numbers calculate the stock having a $88 Fair Value. MA put out some solid numbers if you take out foreign exchange. Last qtr revenue rose 4%, but increased 9% without F/X. Profit growth would have risen 22% but was pulled down to 14% growth due to the strong dollar. I would love to say growth is back to the teens, but Estimates show otherwise. With the Est LTG at 16% and a 1% yield that makes a combined 17% total annual return (hypothetically), but MA just isn’t doing that right now. MasterCard management is great about disclosing long-term profit growth goals. In the past management has stated it will hit 20% earnings growth long-term — and it did. Now the goal is mid-teens from 2016-2018 but that will be in the low-end of the range this year. Personally, I have trouble thinking the company can deliver 10% growth in 2016 with 3% growth now expected. Also, notice the stock has a P/E of 27, which is high historically. 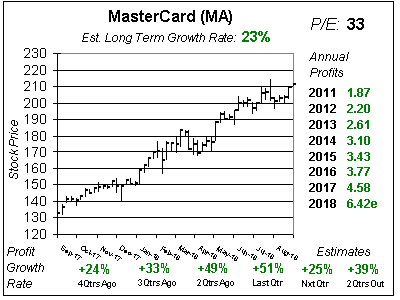 MasterCard is a core stock holding for investors who desire growth with good degree of safety. But a high valuation and slow profit growth due to F/X keeps me away from owning it at this time. This stock used to deliver 20% growth with a P/E in the teens and now is producing single-digit growth with a P/E in the high-20s. I think MA is a fabulous stock long-term and would like to add it to my portfolios when fundamentals improve.